Senior Advantage is mailed twice a year to members of our Senior Advantage program. Senior Advantage Magazine provides health information, safety tips and other information that can help enhance the health and well being of adults age 65 and older. 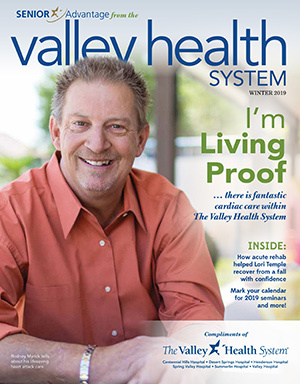 The print version of Senior Advantage is mailed twice a year to members of Valley Health System's Senior Advantage programs. Lori Temple had a busy life that she didn’t want a biking accident to derail. Her rehab team customized a care plan to help get her back to the things she loved. The symptoms were all too familiar. Rodney Myrick knew exactly what the sudden pain in his chest, arm and jaw meant. He’s usually at Henderson Hospital for his job, but this time he was there as a patient.